Many of us have been working with and around online gaming for many years. Given the current resurgence of interest because of changes in statute, I thought my one and only foray into online gaming might interest you. In the early 1990’s I was in charge of the Technology Outreach Program for the Association for Computing Machinery, one of the two largest and oldest professional societies in computing. I was also on the Membership Board tasked with retaining existing members and recruiting new ones. One of the ideas being passed around at the time was “engagement” – the art of getting professionals connected with the society and exposed to the publications, events, and services with the end toward new memberships. This is where my two hats became one. By 1993, like most advanced Web developers and innovators, I was experimenting with Internet interactivity. Some were working on forced feedback data gloves, some were developing push technology, others on recommender systems, etc. My interest was participatory environments. Specifically, participatory environments that would serve education, broadly defined. A fortuitous event happened that year. The server development community, led by the NCSA team, released the Common Gateway Interface (CGI) standard. By modern standards, this wasn’t much of an achievement. But it was pretty radical in 1993. All of the Web server developers jumped on this, and the entire Internet began to come alive with interactivity that year. CGI scripting was born and my two hats converged. I had been working on a ‘college bowl’ concept for the ACM. College bowls had been around for 40 years by that time, and were sufficiently cerebral to appeal to academic types. My initial thought was to re-create the college bowl on the Internet to engage ACM members and potential members. A question/answer database in the computing and IT category existed, but I couldn’t get a license to use it. I had to come up with another plan. Samuels had already developed a checkers playing program by then, but that didn't hold out much interest for me. Chess playing programs were way beyond my programming capabilities (in 1997 a reigning World Chess Champion, Garry Kasparov, would lose for the first time to a computer - IBM's Deep Blue). My options seem limited. There were only two games of chance that I thought were simple enough to implement with CGI: dice and blackjack. I chose the latter because it was the only card game I knew and ACM Online Blackjack went live in 1994. There are mirrors of it that remain online today. Figures 1-3 illustrates the basic game. The GUI wasn’t much, but this was 1993! Windows 3.1 was a shell running on top of DOS at the time, and the state-of-the-art CPU was the Intel 386. 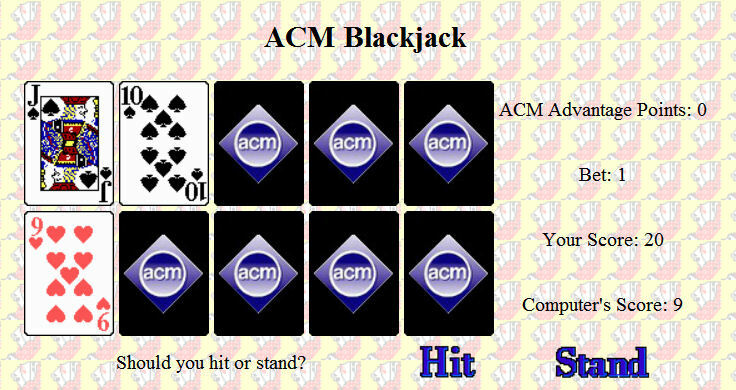 ACM Blackjack was a part of a larger Web effort of mine that I called a web ‘kiosk.’ That seemed to convey the idea of a single point of entry for all of the interactivities I designed pretty well, so I used the term descriptively for many years. What I called a web kiosk would later be labeled a web portal, but I had never heard that term used by that time. My kiosk included a customizable, interactive global events calendar, a volunteer hotline that connected volunteers with needed services, and a variety of other resources for ACM members of all stripes. Figure 3: You're a Winner - you get a lifetime subscription to my online columns! My online blackjack has been online and working well since 1994. I should probably mention that it never occurred to me that there would be any money in online gaming, so I failed to apply for any patents! I should have asked Sheldon Adelson or Steve Wynn for advice on this one.